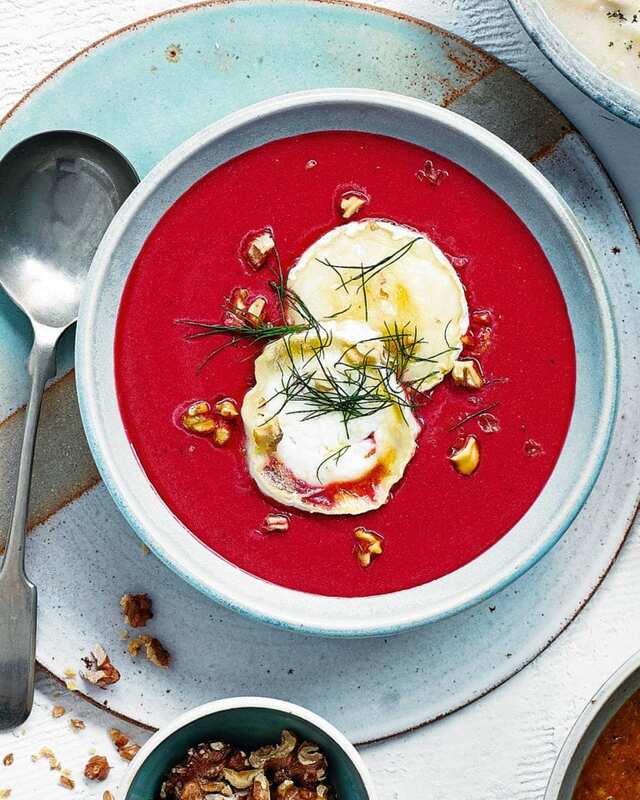 Beetroot imparts a gorgeous pink hue to this Scandi-style vegetarian soup recipe. Serve with rye bread as a stunning starter. Heat 1 tbsp oil in a large casserole (with a lid), add the apple, caraway seeds and chopped red onion. Cook over a medium heat with the lid on, stirring occasionally, for 15 minutes until caramelised. Add the toasted walnuts and cook for another 3 minutes, then pour in the vegetable stock. Add the chopped cooked beetroot and the chopped pickled cooked beetroot (see tip), simmer for 2 minutes, then pour into a blender or food processor and blend until smooth. Return to the pan to keep warm and season to taste. Heat the grill to its highest setting. Put the goat’s cheese slices on a baking tray lined with non-stick baking paper, then grill for 4-5 minutes until golden and bubbling. Divide the soup among 4 warm bowls and top each with 2 slices of goat’s cheese, a sprinkle of chopped toasted walnuts and a few fresh dill sprigs. Pickled beetroot adds a tang, but if you can’t get hold of it use regular cooked beetroot and a squeeze of lemon. Make up to 3 days ahead (without the goat’s cheese), cover and keep in the fridge. Freeze individual portions in food bags for up to 3 months.